I, like most fiber artists, started sewing when I was a little girl. I’ve always loved color, texture and playing with patterns. Like many fiber artists, I too, have tried many media: knitting, weaving, making wedding gowns, etc. I stumbled upon art quilting at an exhibition at the Textile Museum many years ago. I thought, well, this is it! I’ve love the art quilting ride and hope that I have many more miles to go on this journey. My recent work has focused on an edgier style that involves positive imagery and text of all kinds. This came about after a train ride to NYC and many trips abroad. I saw lots of graffiti and was struck by the colors and boldness. Unfortunately, a lot of it was quite negative. I decided to take that same boldness, apply it to my art using paints, hand dyeing techniques, raw edges and inspirational text. 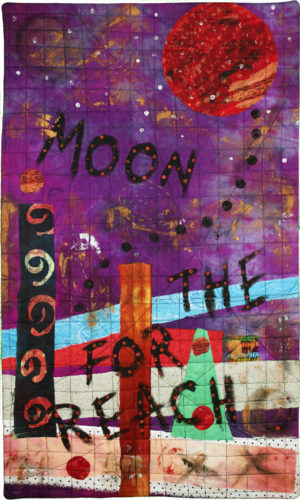 When the “Fly Me to the Moon” opportunity was presented, I was so excited to apply my creative style to the idiom “Reach for the Moon.” It’s such a positive phrase and reminds us to keep striving toward our dreams and aspirations. I’ve heard an expanded version of this phrase– “reach for the moon and you just may land upon a star.” I hope this piece will inspire the viewer to dream big and to keep reaching. Machine quilting, hand quilting, and raw edged applique. Hand dyed cottons, commercial cottons, variegated perle cotton thread and fabric paints.